B&O Railroad (yellow) lies south of the Potomac River(blue) through much of Hampshire County. 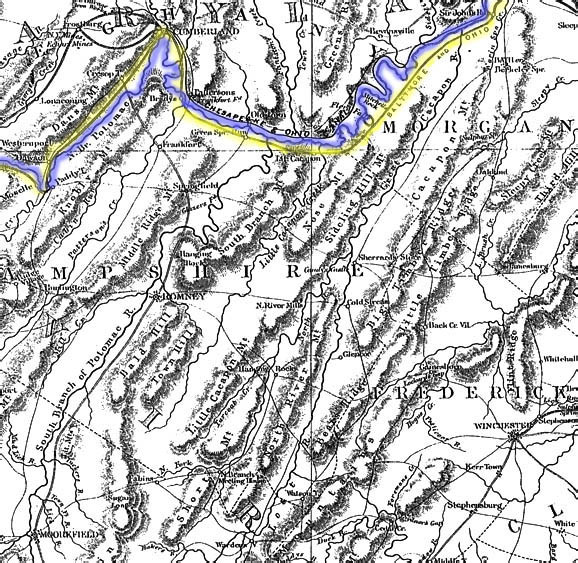 From Jefferson County west to Brady's at the mouth of Patterson's Creek, the Baltimore and Ohio Railroad runs on the south side of the Potomac River in what is now West Virginia (the Potomac is outlined by blue and the railroad in yellow). This route was one of the Union's main supply lines to Wheeling on the Ohio River and on to the west. Stonewall Jackson was one of the Confederates who realized the importance of disrupting this vital Union supply line. Gen. Jackson realized that at the mouth of three Hampshire County valleys - the Cacapon, the South Branch and Patterson's Creek - the railroad was on Confederate territory. His tactical training told him that these three rivers and their wide valleys were highways for his soldiers to use in lightning strikes at the B&O. It was his determination to destroy this vital supply line that made Jackson embark on his Romney Campaign in early 1862. He decided to make Romney on the South Branch River his base of operations for a campaign to destroy the railroad as it passed through Confederate territory. For the most part the campaign was a failure; however, it was the bitter cold winter weather and political wrangling in Richmond that caused Jackson to abort the campaign. For the rest of the war Romney was considered important to the Union strategy, because it guarded the approaches to the B&O as it made its way along the Potomac River. This is one of the reasons Romney changed hands so often during the course of the War. see: Stonewall Jackson's Romney Campaign, January 1 - February 20, 1862; by Thomas M. Rankin; H. E. Howard, Inc., Lynchburg, Virginia, 1994. © 2000 Charles C. Hall.